Conquer the mega loop stunt, double loop challenge or the loop ‘n launch showdown — there are countless variations for re-configurability and includes a “Builder’s Guide” to drive creativity. Track Builder is all about experimenting and developing skills that drive problem solving and crank up the competition! SKU: FLK90MAT. Categories: Cars, Farm and Vehicles, Road Vehicles and Playsets, Toys. The box is the ultimate storage solution and it’s portable! The set is also brick compatible with pockets on the lid to build up anything you can imagine! Many of the items in the Multi Loop Box have more than one use, so kids can keep their imaginations –and their tracks –growing with a series of nearly endless configurations. Connects to other sets and track. Enhance your builds with household items like red cups, paper tubes, books, and more. Challenge Accepted! 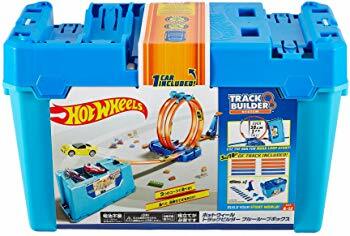 The ultimate storage and stunting solution done the Hot Wheels way with 10 feet of track! The crazy loop action is amped up by connecting track to the lid in 8 places and the bottom of the bin has 2 scoring buckets built in plus a place to connect track, additional sets or components taking the action to a whole new level. Build and expand your Hot Wheels Track Builder world of stunts by combining compatible sets and track from Track Builder!